Shine some sunny sophistication on your ensemble with this recycled bronze amulet. Shine some sunny sophistication on your ensemble with this abstract amulet by Alejandra Noguera-Garces. 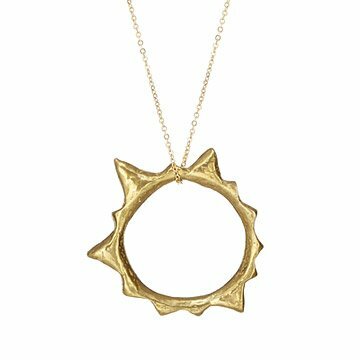 Hand cast in recycled bronze, the shining, sun-like circle exudes organic appeal and will lend positive energy to your accessories. Handmade in Alejandra's Vermont jewelry studio. Inspired by history and the world around her, Ingrid - Alejandra Noguera-Garces created her handmade jewelry label. Her designs are seated in the tradition of empowering objects: imbuing them with a deeply personal narrative that they can convey to people from generation to generation, throughout history. Ingrid - Alejandra looks to alchemy, botany, personal talismans, and the concept of pilgrimage as influences. Using materials such as 24 karat gold, oxidized brass, hand-cast bronze, turquoise, freshwater pearls, driftwood, and other found objects, she achieves a signature rough-hewn elegance in her designs. She lives and works in Vermont. If shinning needed, wipe with jewelry cloth. Do not use harsh chemical cleaners. I love this necklace and get compliments all the time.